How we all, along with Saul, can have a brand new start in life. Topz go skiing and learn how to trust in Jesus always. How the Bible tells us about God's heart for all people and how we can help those in need. Topz look at what the Bible tells us about the many aspects of love and how Jesus' life was the perfect example of how to demonstrate love towards others. How the Bible tells us about God's character, such as His greatness, His faithfulness, His righteousness and His generosity. Plus puzzles, competitions and readers' own pages. 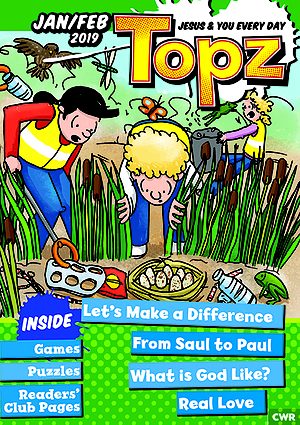 Topz Jan/Feb 2019 - Let's Make a Difference was published by CWR in September 2018 and is our 1481st best seller. The ISBN for Topz Jan/Feb 2019 - Let's Make a Difference is 9781782599111. Be the first to review Topz Jan/Feb 2019 - Let's Make a Difference! Got a question? No problem! Just click here to ask us about Topz Jan/Feb 2019 - Let's Make a Difference.